Happy almost Halloween! Fall is flying by here and we have been busy trying to soak up the last nice autumn days. We did a family horse-pack trip in Yellowstone park last weekend, unplugged and outside for 4 glorious days, such a treat to reset and reconnect with the family unit. Once we came home we jumped right back into the busy life, planning my daughter’s 8th birthday bat bash. My kids get two birthday celebrations, a “family one” and a “kid one”, every year I kick myself for starting that tradition. I go a little overboard on celebrating birthdays, and I was pondering why the other day. Then it hit me, I learned it from my mom, even though I was ten out of eleven kids she always went big for my birthday celebrations and made me feel super special on my birthday. It’s ingrained in me to carry on the tradition I guess. Plus birthdays are cause for big celebration in my book, every year we get on this glorious planet should be honored and marked by some joy making! Anyway, we had a great bat bash. I made these cookies to share with the parents that might happen to linger at the party. Alas not a parent stayed so, me being the only parent in attendance got to eat a couple of these babies, the rest are in the freezer waiting to be consumed by some Halloweenies. 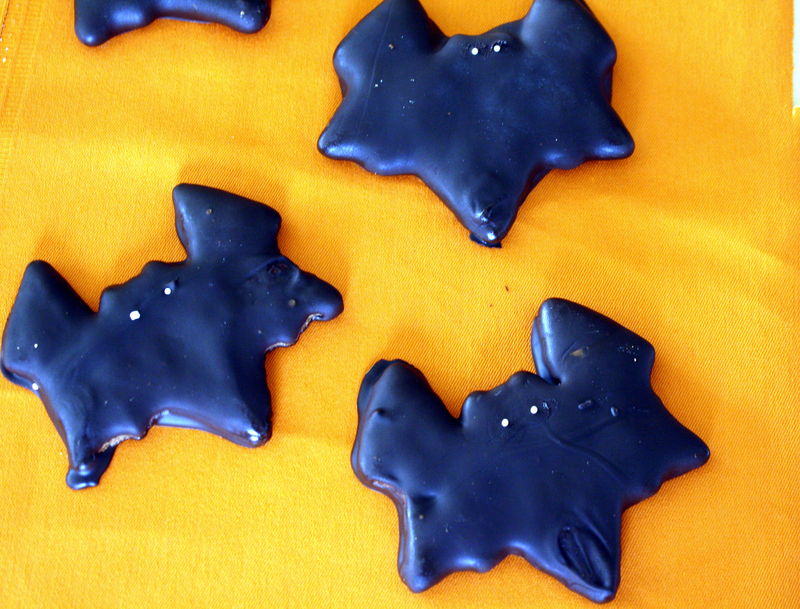 I used Elana’s pantry recipe for “Girl Scout PaleoThin Mint Cookies” that you can find HERE and a bat cookie cutter. The only change I made was to cut the sweetener in half. By the time they got a thick coating of dark chocolate, my bats were far from thin, but oh so delicious. I used Trader Joe’s Pounder bar of 70% Chocolate to dip them in. Check out her recipe if you want to relive the Girl Scout thin mint cookies in a little bit healthier fashion.